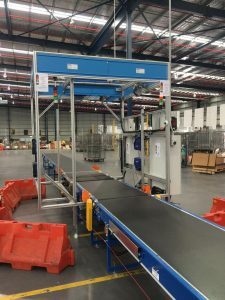 CouriersPlease, a leading parcel delivery expert with nationwide coverage across Australia, and a member of the Singapore Post Group of Companies, has chosen SCACO as the supplier of new parcel dimensioning, weighing, and scanning equipment at their new Brisbane branch location at Salisbury. 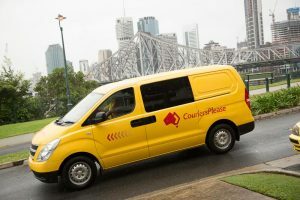 CouriersPlease provides a range of domestic parcel delivery services, including priority and same day courier, as well as international courier services connecting its customers to over 220 countries. To provide more flexible and convenient delivery choices for online shoppers, CouriersPlease has a network of POPStation parcel lockers that allow customers to collect their parcels at their own convenience. In addition, CP has established a strategic partnership with HUBBED (a one-stop eCommerce service aggregator with a network of retail parcel collection outlets in every major city across Australia), to provide even more flexibility through offering after hours parcel collection. The innovations in delivery choices are driving an increase in both the volume of parcels and the diversity mix of parcels through the depot. In 2016 National Network Manager, Trevor Dyson, planning a relocation to better cater to the increasing parcel volumes, contacted SCACO to discuss a range of options to enhance parcel dimensioning performance in a new system to be installed at their new CouriersPlease Salisbury depot location. 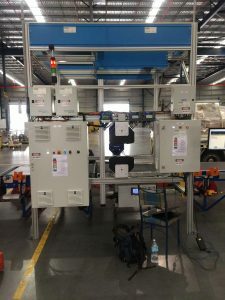 Above: New DWS Parcel Dimensioning System during the installation and prior to going live. The direction of travel is toward the image viewer. Gapping (spacing) belt precedes the weighing belt. Above: Components of the DWS parcel dimensioning station during installation. The large cabinet at left is the motor control cabinet. The cabinet at lower right is the industrial pc cabinet that runs the Harmony DWS system software. 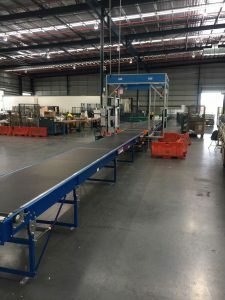 The CouriersPlease Brisbane system comprises two 9-metre belt-over-deck conveyors supplied by Longreach Systems from Adelaide, famous for their Australian-made telescopic conveyors. On either side of the conveyors is positioned the Dimension Weigh Scan (DWS) station or tunnel. This “hybrid” system comprises left- and right-side laser barcode scanning for traditional 1D barcodes and top and front side vision barcode scanning for both 1D and 2D barcodes. The DWS parcel dimensioning system includes a complete range of SCACO’s Harmony Software modules that provide systems integration, data capture and export, system control, analysis, diagnosis, barcode filtering, email shift and trend reports, and parcel image capture and export. In other words, everything that a DWS system ought to have and that a manager needs to understand is the system running efficiently. SCACO also worked closely with CouriersPlease I.T. Integration manager, Silvio Mueller, to configure the export file required and define the rules in the DWS system. Above: New DWS System during the installation and prior to going live. As a systems integrator SCACO is all about capturing, exporting, and supporting the data. In nearly all DWS systems SCACO can remotely log on via TeamViewer or other log-in programs and support customer data requirements in real time. This is a core value-add and is not something that can be expected from a straightforward hardware supplier. Story by Rhett Talley. To learn more about SCACO and automated DWS for parcels or pallets contact contact me at SCACO on 07-3808-9644.